If you are looking for a breath of fresh air from the standard venue and are interested in a private setting, then consider the beauty of Pierce Cedar Creek Institute. Our rates for renting the entire Visitor Center, which includes our auditorium, dining room, commons area, deck and veranda range from $500 to $1500. To receive an information packet, please contact Michelle Quesnel, Hospitality Coordinator, at 269-721-4180 or quesnelm@cedarcreekinstitute.org. 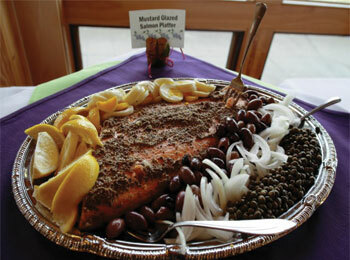 One of the highlights of Pierce Cedar Creek Institute is the Dining Experience. Whether an event calls for a mid-day snack or a sit-down meal, our on-site Chef will work with you to design a menu to meet your needs. We offer buffet style, plated meals and/or boxed lunches. Our menu offers vegan, vegetarian and gluten free options. The simple beauty of Pierce Cedar Creek Institute is the ideal place for intimate, casual or formal, indoor or outdoor events—weddings, receptions, rehearsal dinners, funeral luncheons, corporate events and business meetings, baby/wedding showers or family celebrations. 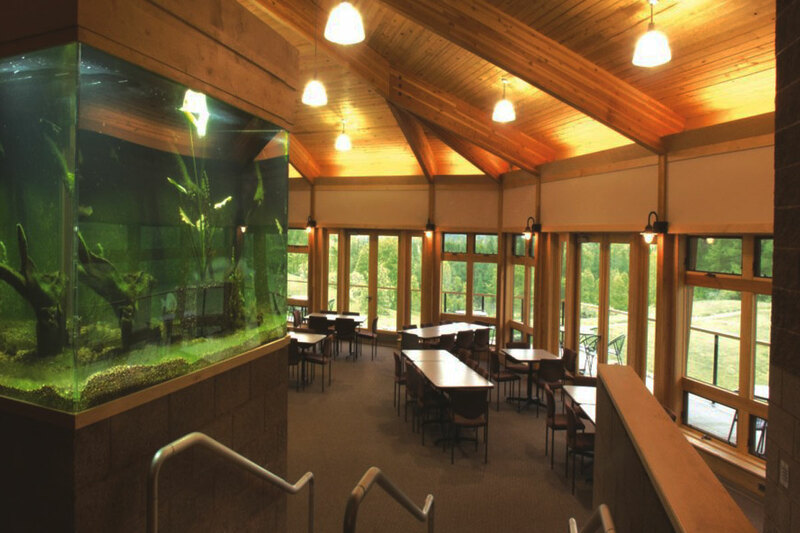 With meeting space, dining space, and lodging surrounded by beautiful and varied habitats, including wetlands, prairies and old growth forests, Pierce Cedar Creek Institute provides a central location for groups to engulf themselves in a retreat experience. 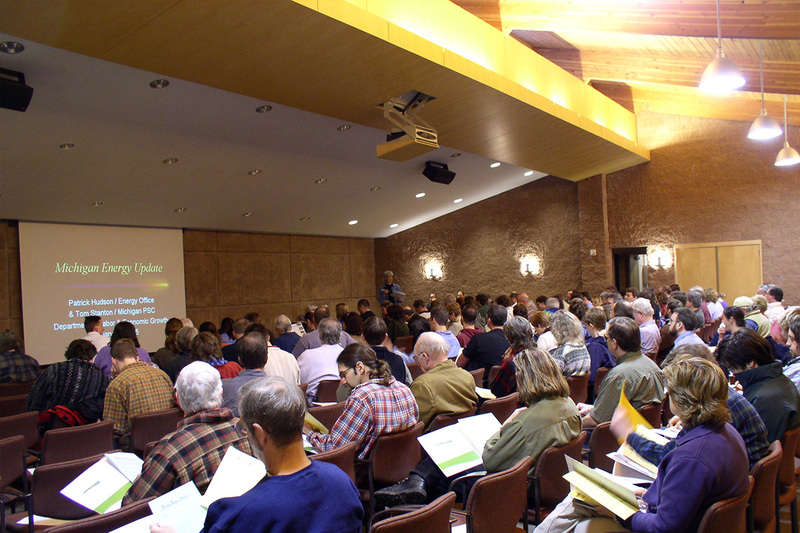 We can accommodate groups up to 44 guests for multiple day meetings or retreats. Our earth-bermed Visitor Center offers modern amenities amidst unique architecture and spectacular views. With its expansive window-lined dining room, auditorium with complete audio visual capabilities, reception/seating area wrapped around a wood-burning fireplace and gallery hallways, our Visitor Center is a space your guests will thoroughly enjoy and appreciate. Click here for a map of our Visitor Center. Located in the heart of the Visitor Center, our Commons Area opens onto our deck, which overlooks a natural prairie. This area is perfect for a registration area, information tables and/or appetizers and refreshments. 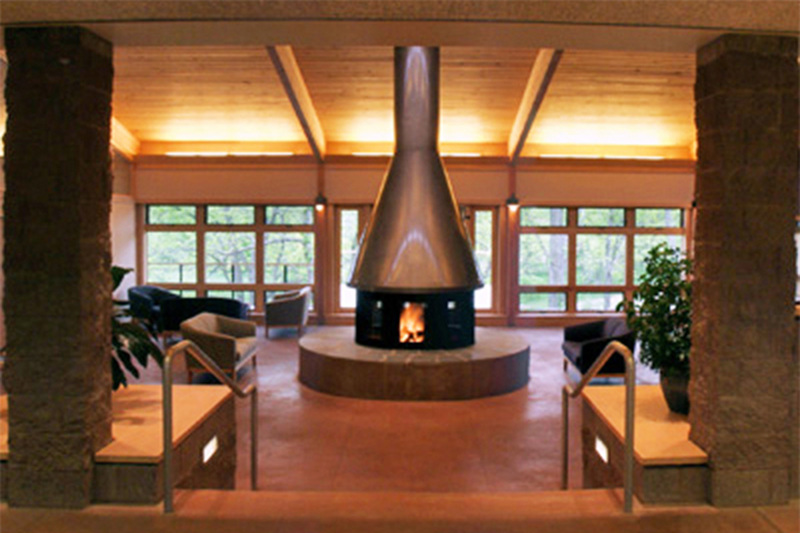 The unique and stunning wood-burning fireplace is the focal point of the area. Like the dining room, an expansive line of windows opens the room to the outdoors. Our auditorium is equipped with everything you need to hold a meeting or event. A large screen, easily seen from any location in the room, makes PowerPoint presentations impactful for everyone. Bring your own laptop or utilize ours with your thumb drive or access web-based documents, show a DVD, or stream from online. Whatever your presenters' style, we can accommodate their needs. The auditorium is located in our Visitor Center. 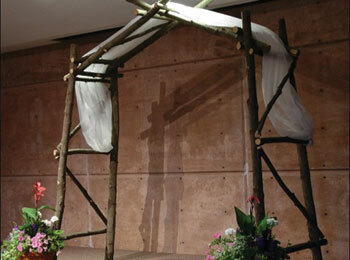 Capacity: Theatre Style: 180 people, Classroom Style: 76 people, Banquet Style: 100 people. 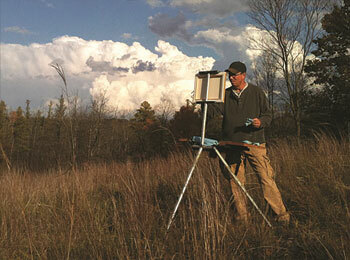 The dining room, located in the Visitor Center, offers extraordinary views of the natural landscape. The 1,000 gallon aquarium filled with native Michigan fresh-water fish is sure to be a conversation starter among your guests. Capacity: Banquet Style: 80 people. 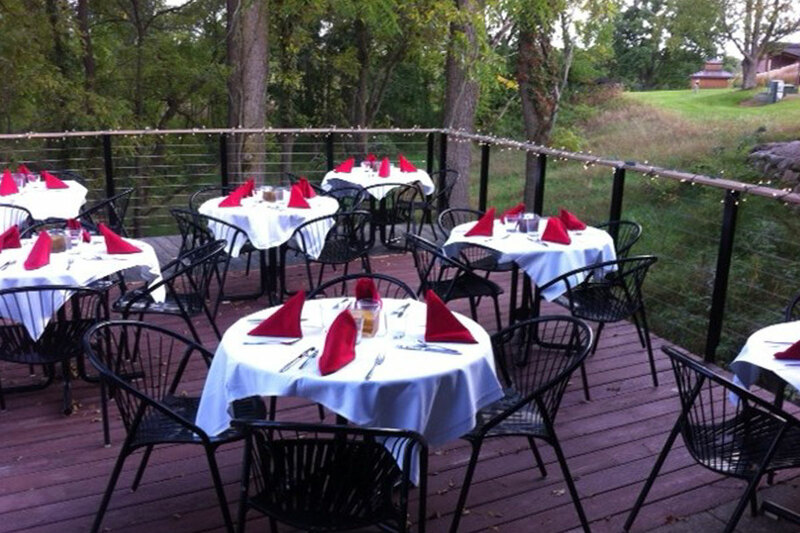 Step outside the Visitor Center onto our deck and veranda, which wraps around the Dining Room. Both provide great spaces for summer BBQ’s and outdoor events. Capacity: Banquet Style: 36 people. 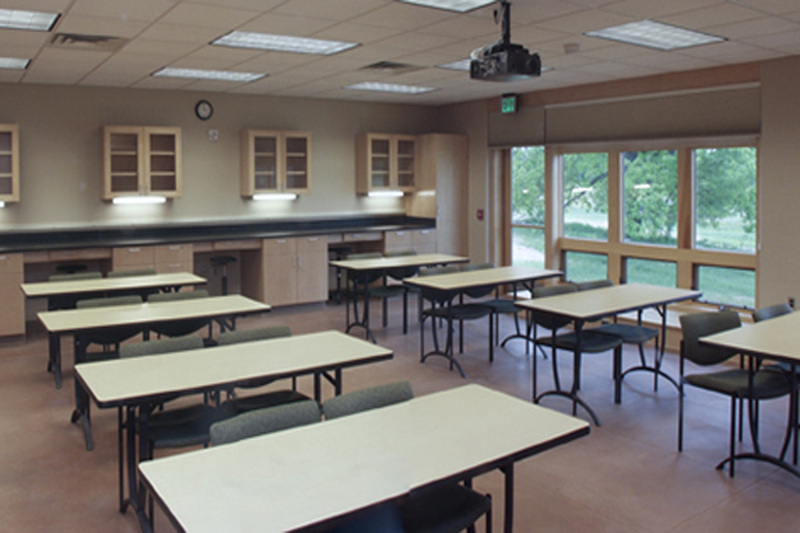 Located in the Education Building, the education classroom and the lab classroom are available for classes and business meetings. 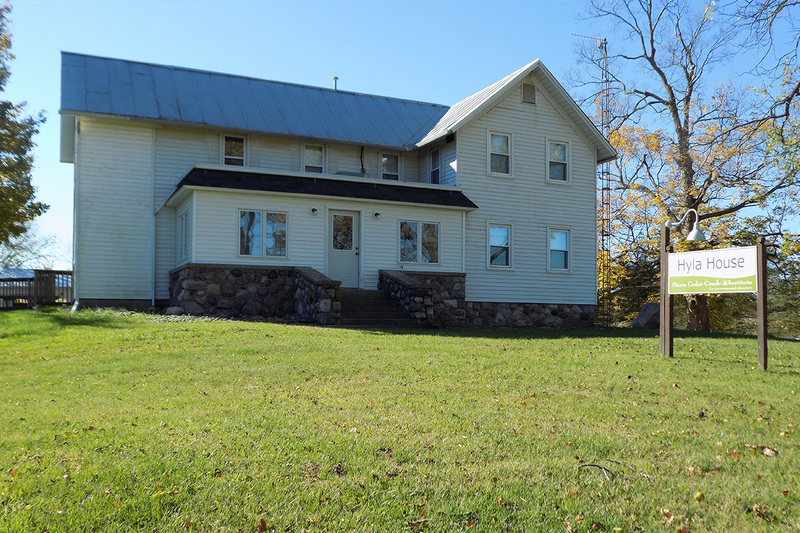 Our three lodging properties are simple, offer a “cottage-like” feel and can accommodate up to 44 guests. Two of our properties have living room/lounge areas and fully equipped kitchens—perfect for small meetings or socializing. Wi-Fi is available and bon fires can be enjoyed outside each home. 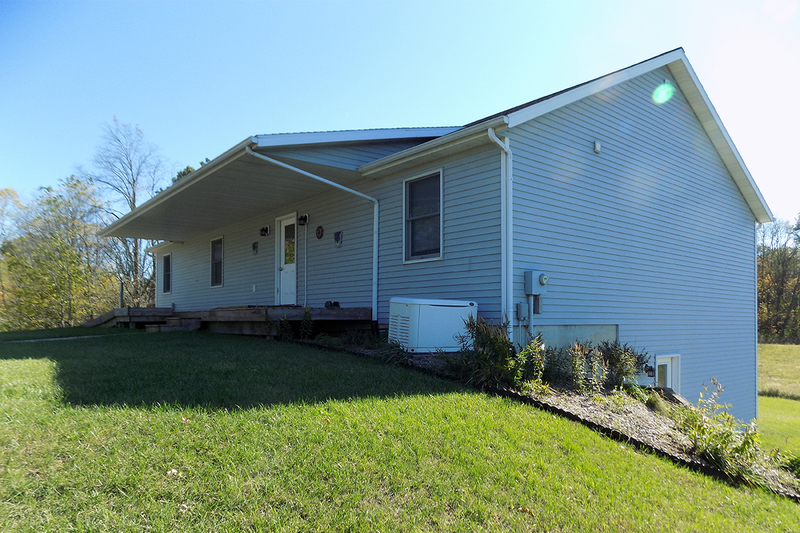 This remodeled farm house has eight single rooms and three double rooms accommodating up to 14 guests. There are four full baths, an open-concept kitchen, a dining room, and a living room, which will allow your group to enjoy each other’s company in the comfort of a home setting. One room and bath are barrier free. Located on the main campus with sidewalk access to the Visitor Center and the Education Building. Prairie View has four double rooms each with a private bath and can accommodate up to 8 guests. All rooms and baths are barrier free. 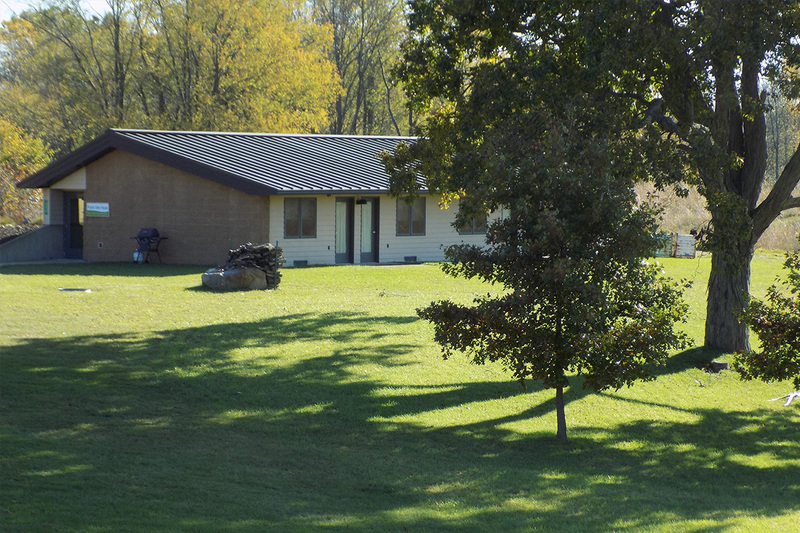 With eleven rooms, Meadow Lodge accommodates up to 22 guests in two single rooms, seven double rooms, and two triple rooms. There are four full baths. Located on the lower level is a lounge area with a kitchen, which is a great spot for groups to relax and socialize. Two single rooms and one bath are barrier free.